So, this weekend, having a bit of spare time between the usual stuff, I did a bit of ambitious catch up. 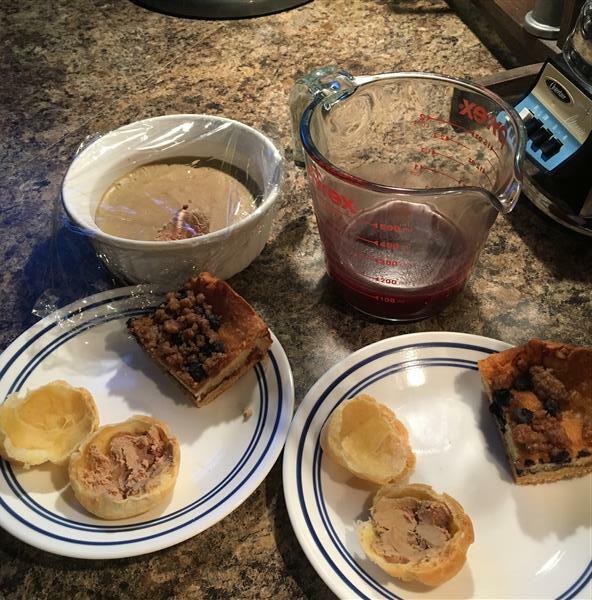 I made cream puffs, faux gras, and blueberry crumb cake. Somehow, I missed taking any pictures of the cookies or the crumb cake, so all you get in any detail is the process of making cream puffs. I didn’t photo document the process of making faux gras because… well, I was slightly grossed out and wanted to get it over with as quickly as possible. I’ve made cream puffs and eclairs before, but I always forget just how simple they are, given the impressive result. Like Marie, I’m tempted to make up a whole bunch of them and freeze, just to have something on hand to throw some creative/seasonal filling into, and serve as a fancy-looking appetizer at a fancy party. I don’t throw many fancy parties, though, so they’d probably just end up freezer burned. 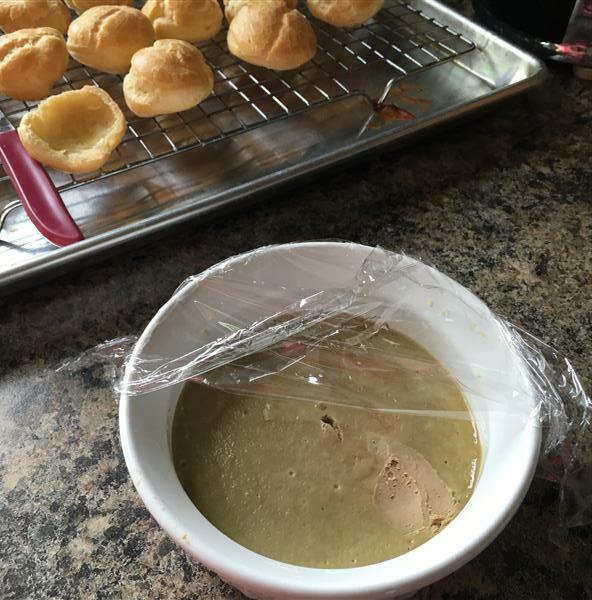 Pâte à Choux is the dough for the puffs. It’s made by stirring together a flour and water concoction on the stove, cooking the flour as you do so. You then gradually beat eggs into the hot paste. Rose offers a food processor method, but I did it by hand, because my dough whisk is great for this type of thing, and so much easier to clean than the food processor. Plus I don’t mind the exercise. That makes a sticky, kind of runny dough, which is then piped onto parchment, on the back of a sheet pan. I assume you use the back of the pan to prevent the uneven browning you’d get at the edges if the walls of the pan faced up. 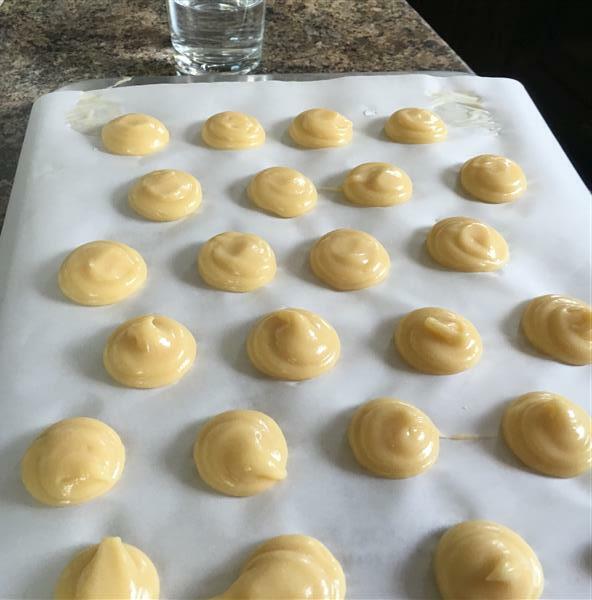 After piping the little mounds, use a wet fingertip to smooth the peaks on the top. 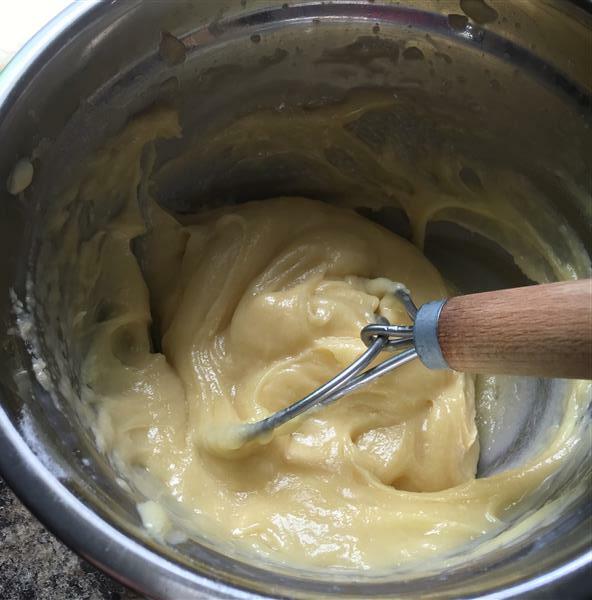 In the picture below, I’d smoothed about half of them. Then bake them. Earlier in the day, I made the “faux” gras. I couldn’t find any chicken livers, which the recipe called for, so I used duck, which we found at the Kitchener Farmer’s market. 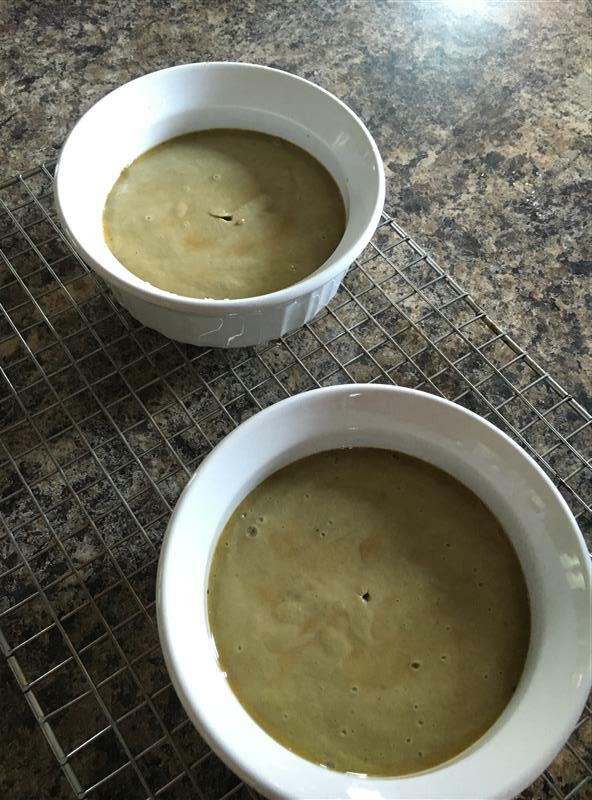 The process for making pâté is pretty straightforward. Cook onions in some butter, add cream & garlic, pour in with the livers, purée, then bake. This next picture is at the “then bake” stage. 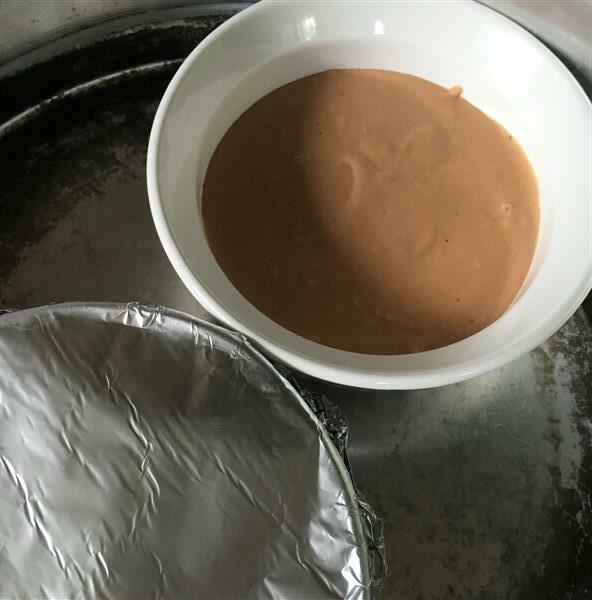 Looks like pudding? It did not improve on the “appetizing” scale after baking. 😦 Do I have to eat that? We got out a spoon and each tried a tiny bit. Now that’s a tasty cream puff. Still, if something’s worth trying, it’s worth trying all the way, right? So, after supper, I made the ruby port caramel. Which is really yummy. A teaspoon each (I didn’t even round it) of the “faux gras” pâté… then the caramel on top. I think I could tolerate pâté if it were with some really strong cheese, or a super salty cracker, or something like that… but not with sweet. Liver definitely does not go with sweet, to my palate. 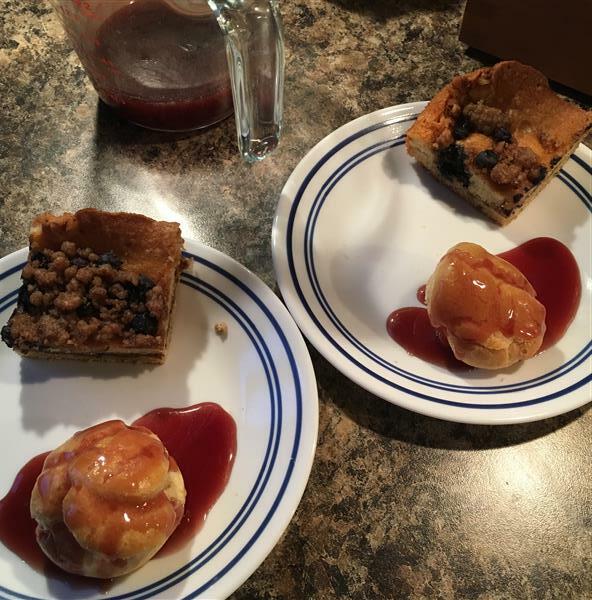 Now, the ruby port caramel sauce with the blueberry crumb cake? That’s a winning combination. I bet it’s even better on a cream puff filled with ice cream. Oh, and the blueberry crumb cake (minus a few pieces kept at home) was a big hit at work! Next Next post: Cream cheese butter cake! It was so brave of you to make the faux gras when you aren’t a liver fan! Try anything once, right? 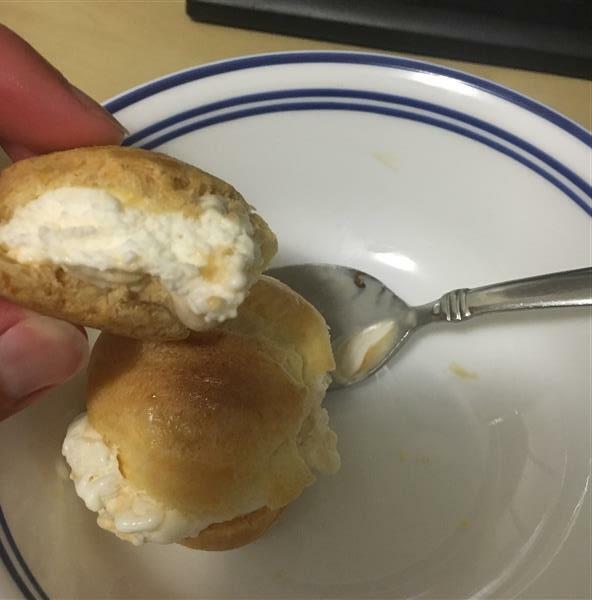 And at least you got the ice cream filled puffs as a reward. “Try anything once, right?” Absolutely! I love (and try to embrace) that attitude! I made the pate too..and I too thought the color looked terrible. I think if use it as a spread on bread is not as bad as eat it on its own as a filling..which seems too much.